The answer to this loaded question has been the subject of much debate and controversy as of late. 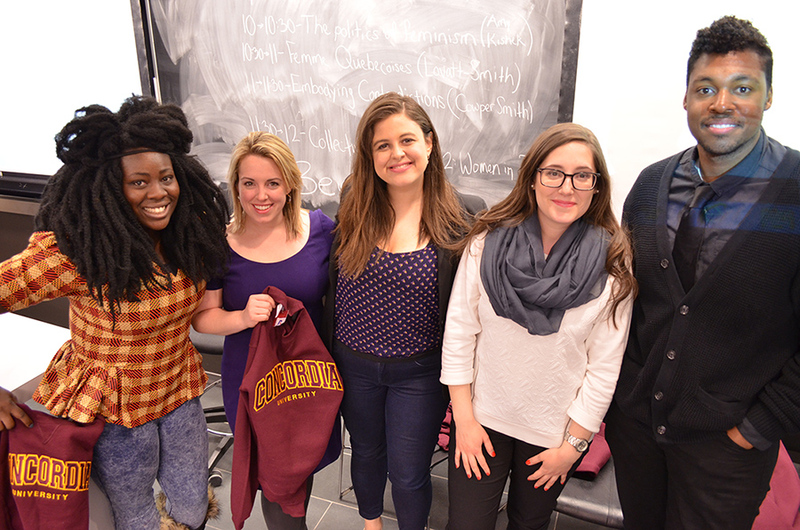 Last Saturday, March 7, Concordia’s School of Community and Public Affairs Student Association hosted an interactive workshop and conference to discuss what feminism means for millennials, in the age of Beyoncé. Stripped of all but its core, feminism is about equality—equality for women, men, and non-binary gendered people of all shapes, sizes, abilities, cultures, and races. The conference carried a strong emphasis on dismantling the idea of a white heteronormative feminism and creating conversations around this idea. Guest speakers at the “Modern Feminism in a Beyoncé World” conference. Photo by Michelle Gamage.. The day was divided into seven workshops, mediated by seven speakers: Junior West, doctoral candidate at the University of Toronto in cellular biology; Amy Kishek, law student at the University of Ottawa; Sara Bourquin, Master’s of Public Affairs from the University of Victoria; Yuriko Cowper­ Smith, Doctorate in Political Science, Guelph University; Katlyn Harrison, a lobbyist with Summa Strategies; Dorothy Attakora, Doctorate in Women’s Studies from the University of Ottawa; and Catherine Lovatt­ Smith, Deputy Leader of Parti Vert, from Concordia University. The speakers, most of whom were admittedly good friends of the event’s organizers, were all educated, young feminists who approached issues pertaining to their respective fields of study in an academic and professional context. Put together, these niche conversations created a patchwork of what millennial feminism and feminists look like in the world of higher education. In addition to the speakers and discussions, three group activities engaged the audience to challenge their own identities as feminists, and what feminism means to them. “If you ever hear that there is one common agenda for feminism, run,” said Attakora in response to a question posed on whether there could ever be a global sisterhood and universal definition of feminism. This was a question that popped up throughout the conference, which came back each time—after much vocal debate—to the conclusion that feminism must be approached from each person’s own unique angle. Everybody approaches these issues with tinted glasses based on their own life experiences and sensitivities. While many felt that aspects of Bourquin’s talk on starting feminist discussions from the vantage point of a white volunteer in Botswana to be triggering and steeped in privilege, others digested the information as coming from personal experience, and therefore valid. Speakers were continuously reminded by the audience to check their privilege, so as not to sully the safe space created at the conference with generalizations. Likewise, many times audience members had to be quieted down when, impassioned, their tone became accusatory towards the speakers for poor use of language or not explicitly mentioning a certain minority group. So what is feminism in the age of Queen Bey, of pop culture icons, and of mass media consumption? Feminism’s third wave, which we are currently surfing, is steeped in the endorsements of pop culture heroes. What all this means is that feminism is in the eye of the beholder. The full conference is available for streaming by going here: youtube.com/watch?v=Rrl-Et_m6Ks.